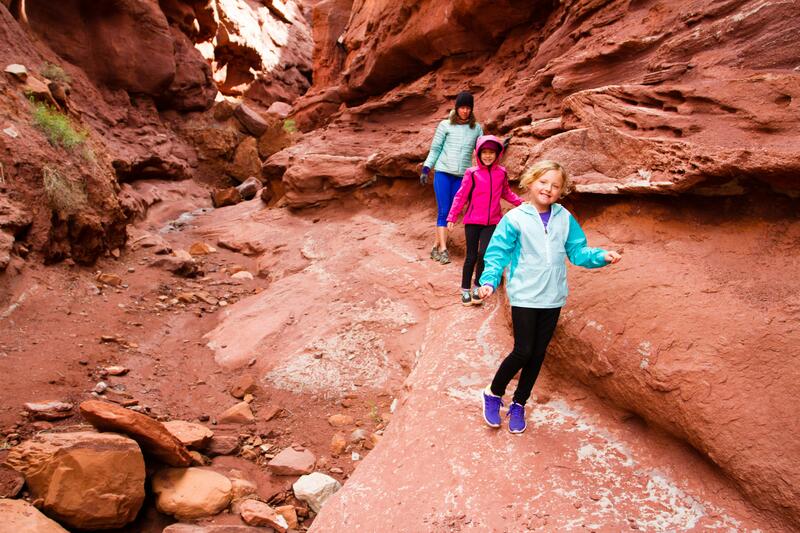 Moab is the ultimate outdoor playground, offering something for everyone. From high-adventure mountain biking on the infamous Portal Trail to an afternoon stroll in the Park, Moab is the epicenter for “all things adventure.” Some of the best mountain bike trails, national parks, hikes, climbs, OHV trails, photography, landscapes…and the list just keeps going…are all found here. Moab is truly in a class of its own, and the mystic has spread far and wide. Every year visitors are coming from around the globe in hopes of seeing what all the hype is about, and they usually leave with just a glimpse of the wonders of this magical destination…already planning their next Moab adventure trip. 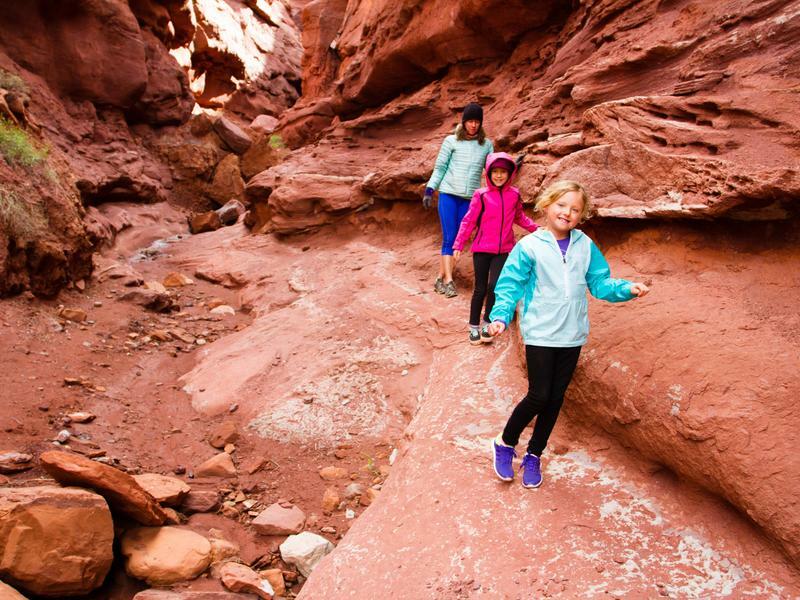 We’ll let you in on one of Moab’s best-kept secrets: the winters in this desert oasis are just as captivating as the other 3 seasons…if not more so….and about all that’s missing are the crowds. Oh…and the value of traveling in the off-season can’t be beat. Hotel rates in winter are typically around 50% of their summer rates. Some of the businesses do take the winters off and hang the closed sign on the door, but most are open and happy to see visitors fill the streets this time of year. Arches National Park tops the list when visiting Moab in the winter. Sand Dune Arch, which is always a favorite for the kids, is less than a mile round-trip and features sand dunes and fins to explore along the route. The Windows Section is a must-see, as the area has the largest concentration of arches in the park. Landscape Arch spans 306 feet and is the longest arch in North America, and the hike is easy at just 1.6 miles round-trip. Iconic Delicate Arch is 3 miles round-trip and is absolutely breathtaking this time of year with the snow-covered Lasal Mountains in the background. This hike can be icy, so it’s recommended that you check in with the park rangers to get updated trail conditions. One of Canyonlands National Park’s most iconic vistas, Mesa Arch, is a must see and even more breathtaking during the winter months. 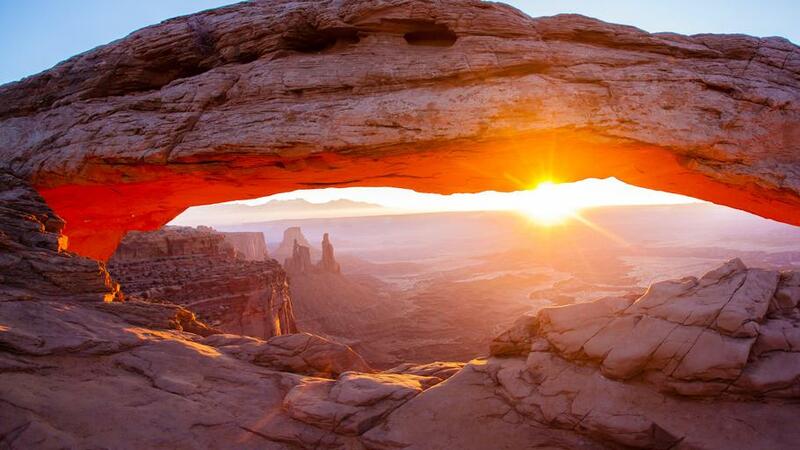 This incredible arch is on the bucket list of photographers around the world for consistently-amazing sunrise shots. The trail is fairly flat and just a half mile, and be sure to pack a camera on this one. The White Rim Overlook in the Island in the Sky District is an easy 1.5 miles round-trip hike that offers amazing views. At 140-feet tall, Corona Arch is a massive beauty that is a must-see. The moderate hike is 3 miles round-trip. The Longbow Arch trail is 2.5 miles round-trip, and be sure to look for the dinosaur tracks and petroglyphs along the way. The Grandstaff Trail is 4 miles round-trip and leads to the massive, 243-foot-long Morning Glory Natural Bridge. Fisher Towers is 4 miles round-trip and winds through amazing red rock fins, pinnacles and spires. 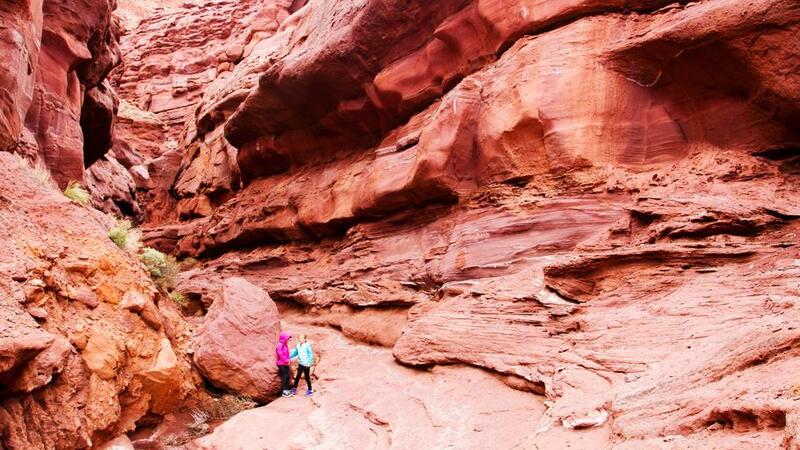 The Portal Overlook trail is 4 miles round-trip and offers unparalleled views of the Moab Valley. Hidden Valley is 4 miles round-trip and leads to beautiful meadows and petroglyphs. Faux Falls, located near Ken’s Lake, is less than a mile and is a great short hike next to an awesome waterfall.